Information: Ljubica S. and Danica S. Janković, authors. 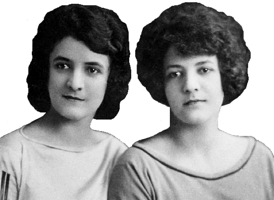 The sisters were born in the home of postal officer Stanislav Ljubica on June 26, 1894 in Aleksinac, and Danica in Lešnica four years later on May 7, 1898. Uncle Tihomir and Vladimir Đorđević, venerable ethnologists, recognized the music gift early, which they would, for example, say they were a sin to stay on formal education only. At that time they had already lived in Belgrade, so it was feasible to dedicate themselves to extraordinary regular gymnasium duties. Ljubica, the elder sister, graduated from the Faculty of Philosophy, where she studied Yugoslav and comparative literature, Serbian and Greek, Serbian history, and Danica, the younger sister, went on the same footing, defining England and France. Danica had the opportunity to complete her two years at Oxford, after which she worked in Tetovo, and then as a teacher at the Women's Teacher School in Belgrade. They were successful and favorite professors, but their real life was somewhere else. They were driven by the magic of the folk dance, led them into some new worlds, and they found their place under the sun. They were highly distinguished in the local scientific circles, especially since Ljubica was elected as a correspondent member and Danica was appointed scientific associate of the Ethnographic Institute of the Serbian Academy of Sciences and Arts. When they published their book "The Yugoslav Games" in 1952, their name resounded outside the country, into the world ethnomusicology and ethnocoreology. They were inseparable, until April 18, 1960, when Danica returned from the theater, delighted with the piece "Goodbye Sheriff." That night she was sick, and doctors struggled for nine hours to save her life. However, the heart did not withstand the severe form of diabetes, due to which Danica, for three decades, injected insulin injections twice a day. Ljubica passed away in 1974. Dances of Yugoslavia. Janković, Ljubica S. and Danica S. New York: Chanticleer, 1952, 40p. (OCLC 10537669); New York: Crown, 1952, 40p. (OCLC 7704511 & 2608191); London: Parrish, 1952, 40p. (OCLC 1515543). Background, music, and instruction for 4 dances. Danses populaires I-VI, resume par Ljubica S. Janković et Danica S. Janković Belgrade: Conseil pour la science et la culture du gouvernement de las Yougoslavie, 1951?, 67p. (OCLC 11589492). (Summaries of 5 books which appeared between 1934 and 1951). Dvadeset narodnih igara, zabeleizile i opisale Ljubica S. Janković i Danica S. Janković. Beograd: Izdanje Glavnog odbora saveza sindikata za Srbiju, 1949, 72p. (OCLC 25541724, microfilm 30448134). Folk Dances; I-VI; summary; collected and described by Ljubica S. Janković and Danica S. Janković. Belgrade: Council of Science and Culture of the Govt. of the F.P.R. of Yugoslavia, 1951, 61p. (OCLC 7704540). Graza o izivotu i radu tihomira R. Djordjevica (From the material on the life and work of Tihomir R. Djordjević. Janković, Ljubica S. and Danica S. Sarajevo: Bilten, 1955, 181-197p summary in English. (OCLC 30067087). Iz slovenaicke knjiizevnosti. Janković, Ljubica S. Beograd: ?, 193-, 206p. (OCLC 26514325). Narodne igre skupile i opisale Ljubica S. Janković i Danica S. Janković. Beograd: Prosveta, 1934. (OCLC 12266447). Narodne igre i knjiga skupile i opisale Ljubica S. Janković i Danica S. Janković (library has v. 1,3). Beograd: Prosveta, 1934, microfilm. (OCLC 7185091). Narodne igre; VIII Knjiga, skupile i opisale Ljubica S. Janković i Danica S. Janković. Beograd: Prosveta, 1964. Prilog prouicavanju ostataka orskih obrednih igara u Jugoslaviji. Janković, Ljubica S. and Danica S. Beograd: Nauicno delo, 1957. (OCLC 4685601 ($10-20 to borrow)). Problem i teorija pojedinaicne aritmiicnosti u ritmiicnosti celine izvozhenja orske igre i melodije. Napisala Ljubica S. Janković. Urednik: Duisan Nedeljković. Beograd: Nauicno delo, 1968. (OCLC 24104444).